St. Patrick's Day is just around the corner so, let's talk about Corned Beef! 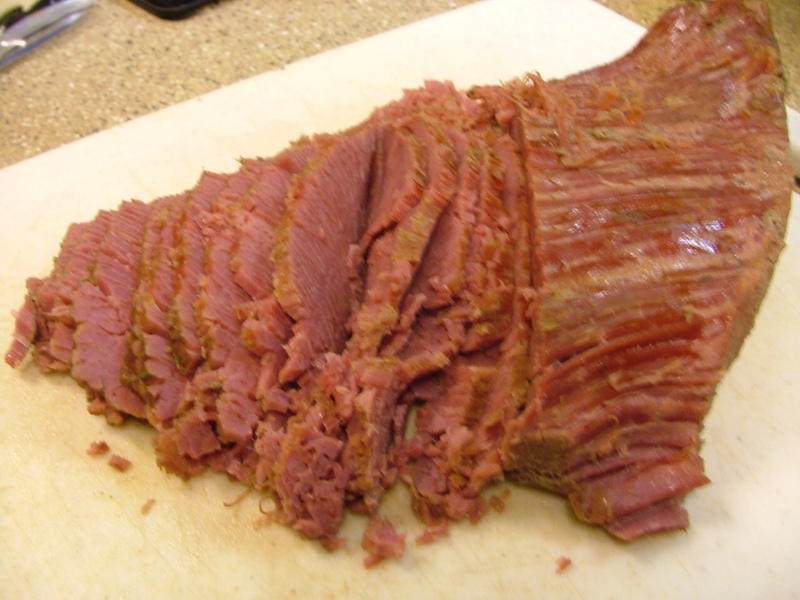 I love March because that's when Corned Beef goes on sale for St. Patty's Day! As a kid, the only corned beef I ever ate came out of a tin. It was a gelatinous, fatty mess, therefore, I decided I didn't like Corned Beef, that is until I tasted "real homemade" Corned Beef! In this post I have included a recipe for cooking Corned Beef in both a Dutch oven or Crock Pot and then move on to making Reuben Sandwiches, and a New England Boiled Dinner. 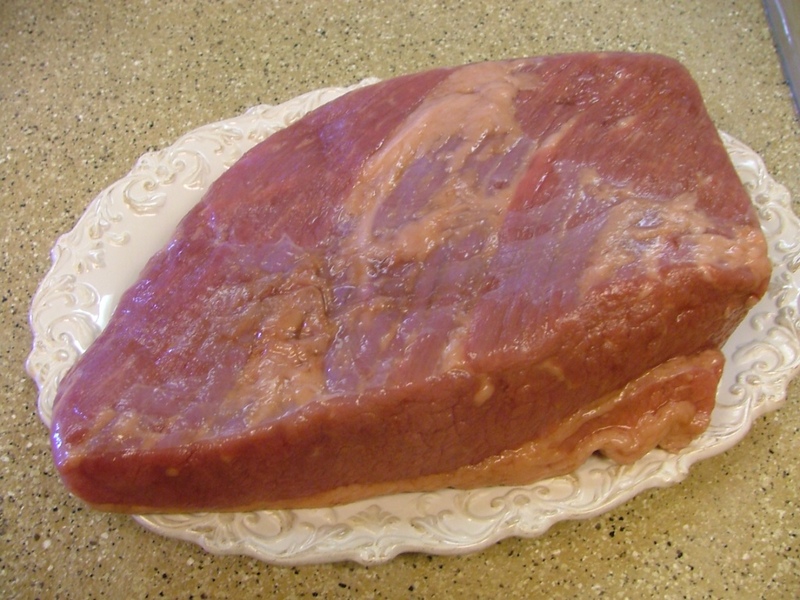 Corned Beef is the brisket of a cow pickled in brine. It comes in three cuts, flat and point and round. The point cut is alway less expensive because it's a round, thicker and fattier cut of meat, which makes it more difficult to cut into nice lean slices. However, I always look over all the point packages because once in a while you will find a lean piece. The meat below is the flat cut. It came in a vacumn sealed package already "corned" and also has a small packet of pickling spice included. And then this year, for the very first time, I ran into a "new cut" called Corned Beef Round. This is the cut you would get at a deli. It's leaner and thicker than the flat cut so, your slices will be larger. Round cut was 50 cents more per pound than the flat cut. When choosing corned beef look for a thick cut without fat running through it. This is a good, lean piece of corned brisket with a thick layer of fat on top. Here you see the other side, notice how lean this brisket is. 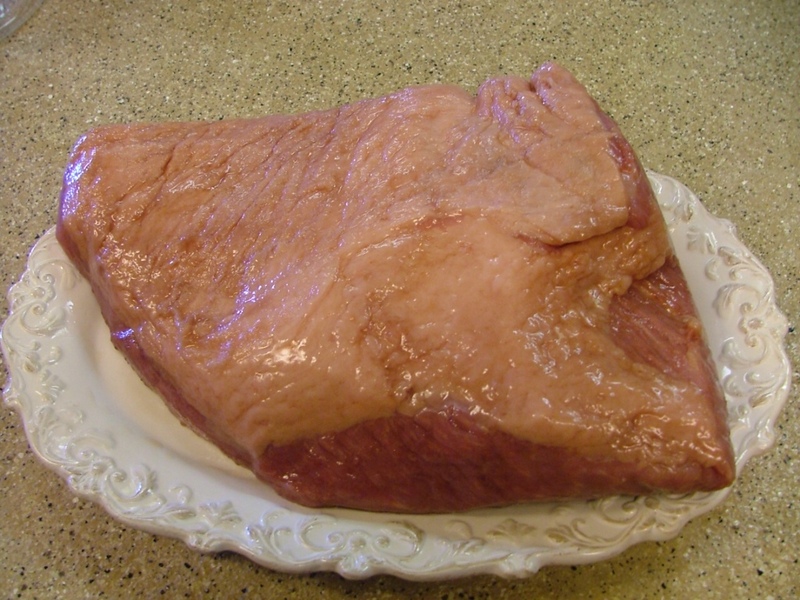 Same brisket with fat trimmed away using a sharp knife. Notice the diagonal striation of the meat. Corned Beef is sliced across the grain. On the stove top use a 4- to -6 quart Dutch oven. Place lid on and bring liquid to boil, reduce heat to a simmer and cook for 3- to 3 1/2 hrs (about 50 minutes per pound). In your slow cooker, cook meat with spices 7- to 8 hrs on low until meat is fork tender. Tip: I cut a double thickness of cotton cheese cloth into a 6 to 8 inch square. 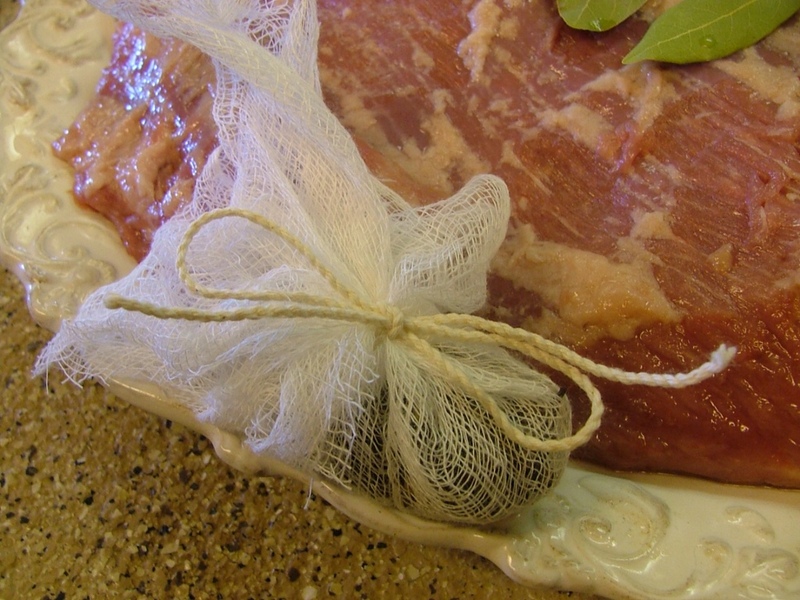 Place my cloves, peppercorns and the contents from the small package of pickeling spice that comes with the meat in the center of the cheesecloth. Bring up the corners and tie with a clean string. 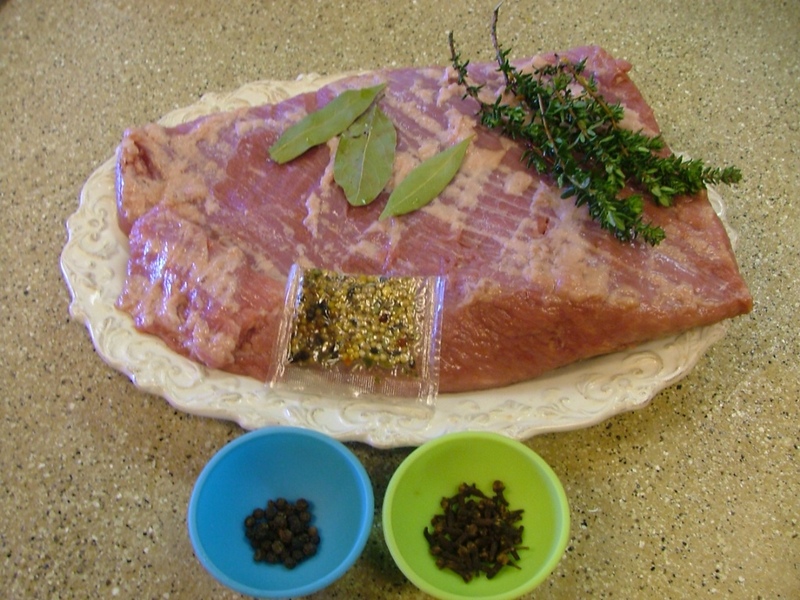 I toss in the bay leaves and thyme sprig on top of the meat. If you don't want to fuss with cheese cloth, just dump all the spices in and scrap spices meat off with a knife when it's cooked. Preheat large frying pan or griddle on medium. Lightly butter one side of bread slices. On 4 bread slices, layer 1 slice Swiss cheese, several slices corned beef. 1/4 cup room temperature sauerkraut, squeezed out. Add a second slice of Swiss cheese. Top with remaining bread slices butter side out. Grill sandwiches until both sides are golden brown, about 3-5 minutes per side. Note: I serve Russian Dressing on the side in a dipping dish because that's the way we like it. You can spread the dressing on the inside of your bread slice if you wish. Ah . . . The Reuben! To make New England Boiled Dinner follow the instructions above for Cooking Corned Beef. After Corned Beef has cooked for 3 hours, add onions, carrots, potatoes, and celery to meat. Return to boiling; reduce heat. Cover and simmer for 10 minutes. Add cabbage wedges; simmer, covered about 10 minutes more or till meat and vegetables are tender. This time around I cooked our Corned Beef in the slow cooker/crockpot with all the herbs and spices. 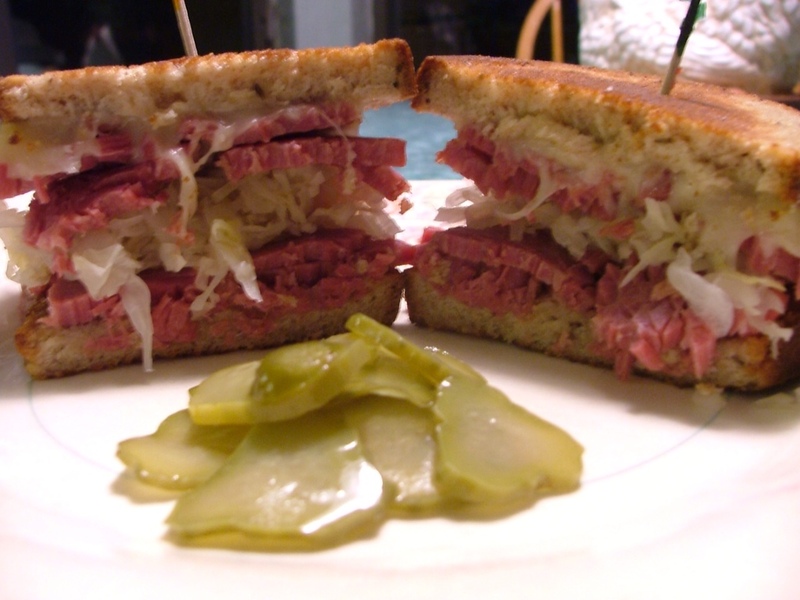 From this meat we ate Reuben Sandwiches and later I made up a big frying pan full of Corned Beef Hash. So, whether you're looking for a big meal of Corned Beef Boiled Dinner, a yummy, gooey Reuben Sandwich, or simple Corned Beef Hash, March is the time to buy a couple of Corned Beefs while they're on sale. That's how I do it . . . Over at Julie's!!! I have tasted her Corned Beef, it is soooooooo delicious! You've got to try it. I highly recommend it!!! Thank you! 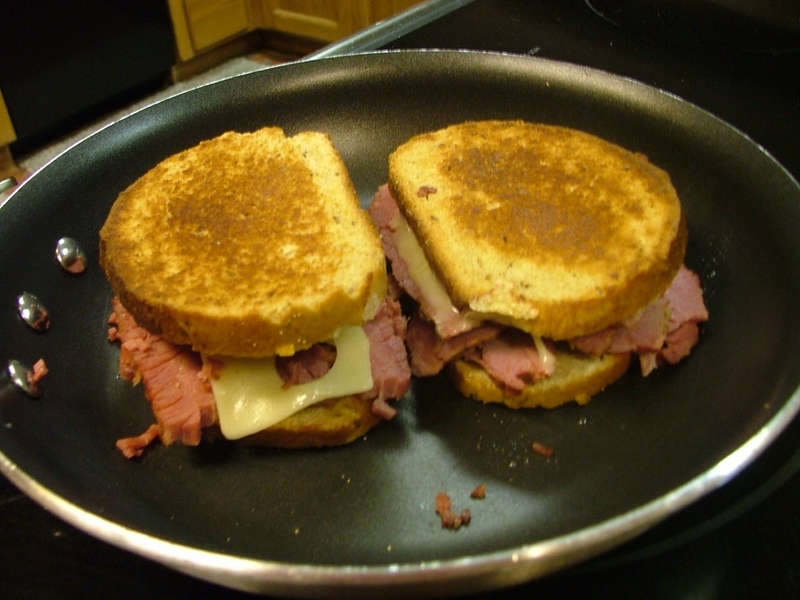 It isn't difficult to make Corned Beef and I sure do love homemade Reuben Sandwiches, especially on homemade rye bread!